It's one thing to promise a slice of New England, but it's quite another to deliver a full-fledged, Martha's Vineyard-esque lobster shop on Sunset Boulevard. Knuckle & Claw, a lobster roll spot that began in farmers' markets, has set up a brick and mortar in Silver Lake, though it channels the Vineyard to a T. Framed photos of the island and its landmarks hang on the walls, while the small kitchen staff takes your order with a kind of small town charm. 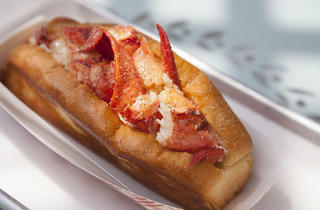 The lobster roll is straight-up Vineyard, too—cold and fresh, it's served in two sizes (four ounces of lobster in a large bun, two ounces in a small) and accentuated by a small amount of butter and mayonnaise. A secret blend of spices top the large chunks of lobster meat. There are other items on the menu, too—a Dungeness crab roll, chowder, shrimp rolls—but, to put it in Vineyard speak: that lobstah is wicked good, and it's all you need. What is in the secret spice blend here? 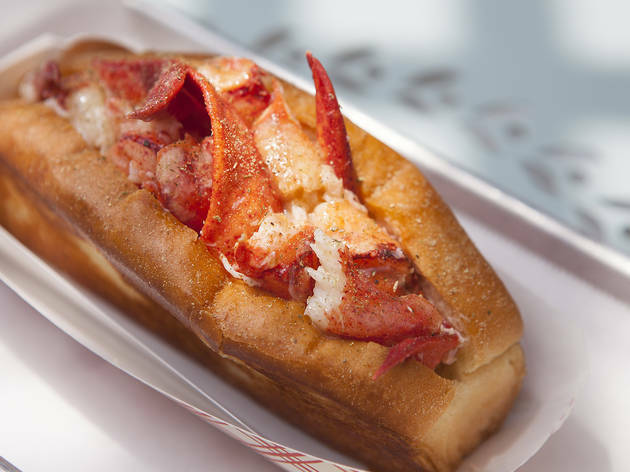 It completely makes the lobster roll, which is already incredible on it's own (fresh, with generous helpings of lobster, and that toasted bun is pure perfection). Knuckle & Claw certainly sticks out a bit on Sunset Blvd - their Vineyard aesthetic doesn't really mesh with Silver Lake's overall vibe - but as someone who's spent time on that magical island, I certainly appreciate it.